This is my recipe for a creamy, delicious and healthy Chai Banana Pudding, featuring nutrient-rich chia seeds. This creamy breakfast pudding is loaded with fiber, anti-oxidants and omega-3 fatty acids. It is a definite upgrade from traditional breakfast cereals! Ounce for ounce, chia seeds contain more omega-3 fatty acids than salmon! In addition this recipe calls for almond and coconut milk making it both gluten and dairy free. Of course do not limit yourself to only having this for breakfast! It is great as an afternoon snack or after dinner treat! Combine all of the ingredients in a blender, and blend until a uniform texture is achieved. Transfer to a sealed container and allow to chill overnight. Note: Chia puddings take practice to get the texture “just right,” so feel free to adjust the amount of seeds or liquid to achieve the texture you desire. Spoon or pour into bowls and top with fresh banana slices. Serve and enjoy! This looks like a flavorful, healthy breakfast. I love chai, so I'll definitely give this a try. Pinned! 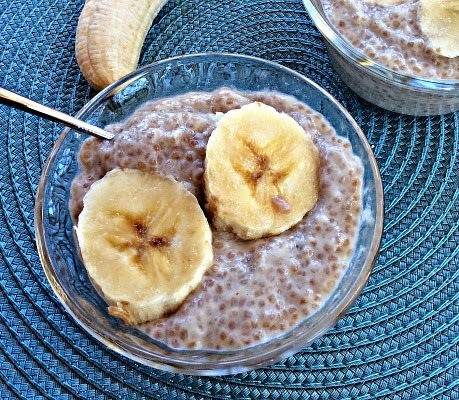 We will just love your Chai Banana Breakfast Pudding, it looks delicious! Hope you have had a great weekend and thanks so much for sharing with Full Plate Thursday!